and are officially the PG Pony Mustang Champions! A great group of boys and great coaches and parents made this year awesome. 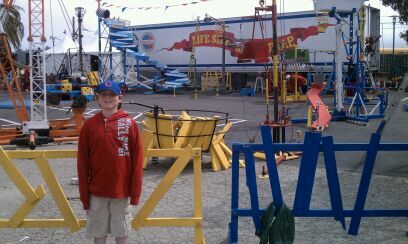 As I have mentioned, life has been nutso around here, but there are certain things (other than the kiddos) I stop for. Jenn from Rook No. 17 (who will probably have a more detailed post soon) has told me about the Maker Faire awhile back, and after checking out the website I HAD TO GO! And I decided this was going to be a family fun day. 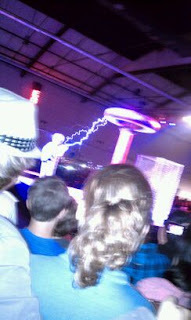 The Maker Faire is an amazing event filled with creative, inventive, think-outside-the-box people from all over. There was everything from crafts, to steampunk creations to tech innovations to sewing to a human/life-size Mousetrap Game to shopping at the Bizarre Bazaar. A little something for everyone! As always happens with my family getting there was a long arduous process. It always is...my family does not travel well together (that is a post all its own!). and the crazy offsite parking was less than ideal, but we survived. Don't you love our infrared photo (the only photo you may ever see of hubby). Thinking of using it as a Christmas Card. I think we look like monkeys! 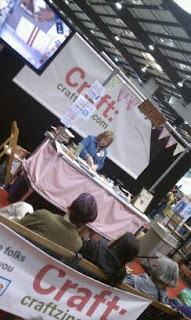 And made it to the Expo Hall around lunch time, and and purely by luck I found myself at the CRAFT: craftzine booth. And even luckier, discovered we were just in time for the demo by Cathe Holden of Just Something I Made. Yippeeee! I watched the demo of making a journal and expanding folder from an old book and she was awesome. Later as we arrived at the Bizarre Bazaar, I happened upon Cathe Holden...and I normally "play it cool" (or so I think)...but just had to tell her how much I loved her demo and her creativity...and she did not think I was a freak (perhaps if I would have made and been wearing my shrinky dinky bracelet she designed for Country Living she would have thought so). Cathe is amazingly talented and beyond nice! If by some crazy chance you have not been to Just Something I Made...go now. Jules's highlight was getting her face - arm - painted at the Klutz booth. 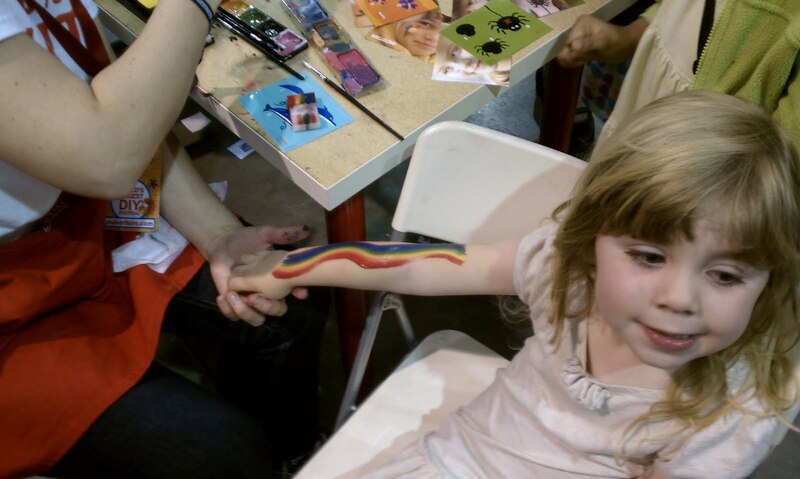 We now own the Klutz face Painting book/Kit. Other highlights included having his name written with his DNA sequence and watching a dude play Rockband and simultaneously make fire. sensational soda geysers as we walked back to the car. 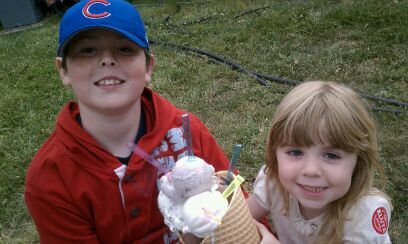 Both kids thought we were the coolest parents for buying the world's largest waffle cone for them (6 scoops of gelato in a huge waffle cone). We all shared it and it was cheaper than each of buying a separate one. I sadly missed the Happy Girl Kitchen Co. Sauerkraut Canning and Adam from Mythbusters, and a few other demos. There was no way on earth we could have done everything in the time we had. We tried...we really tried. I could have spent the entire weekend there. Next year, Just Joe and I are heading there. Joe loved it all, he took it all in...I knew he would be thrilled by what was happening at the Maker Faire. Jules was crabby and it was just too crowded to give her an inch of freedom. Would I go back, yep...with a few changes to the itinerary. The Maker Faire visits cities all over. It is an event like no other I have ever seen. this is an even not to be missed! for free to see what to is all about. The website also has a good wrap up as does the facebook page. 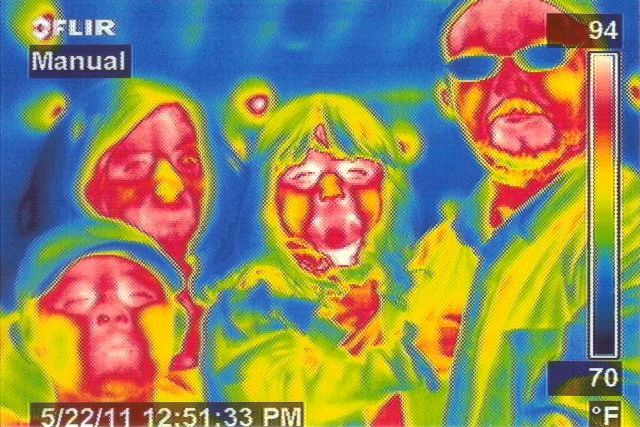 My husband took my kids to the Maker Fair! I should have gone...it sounded fabulous! Congratulations to your son, his team and the coaching staff. Despite the odds, they did it. Proud parents for sure. Congrats to your son Holly--that must have been a fantastic experience for all. Congrats to Joe on the baseball game - that is so fun!!! The Maker Faire sounds amazing. We'll have to try and look one up! Way to go Pony Mustangs! Sounds like fun and your kids are adorable! Sounds like so much fun, Holly! I just checked their schedule and they'll be in KC in June. I'll be there!!! Congrats to your son and his team! The Maker Faire looks like fun! I'll have to find out if it will be anywhere around here over the summer. I'd love to go! wow, that sounds like a fun time. I wish I had a piece of that ice cream cone! funny, (scary) picture hehehehe I dare you to use it for the Christmas Card next year!